You do not have to go with the flow! Do you ever get tired of being told to go along with the flow? I do! Just because many midlife perimenopausal women experience heavy menstrual flow, it does not mean you have to accept this. Importantly, you do not have to choose to have a hysterectomy to cure the problem either! In the past, it was said it was a 'right of midlife passage' to have to undergo a D&C for heavy bleeding and almost 1 in 3 women ended up with a hysterectomy by age 60. Now, women rarely undergo a routine D&C. Rather office evaluations look to see what the cause of the heavy bleeding is by performing a pelvic exam, an office endometrial sampling, and possibly a saline (salt water) infusion sonogram of the uterus with or without an office hysteroscopy (a lighted scope to look inside the uterus right in the office). Once hormonal imbalance, infection, polyp, fibroid or more rarely cancer or pre-cancer is diagnosed, the specific problem can then be treated. For women who have undergone full evaluation and who do not have any anatomic problem noted, there are some new treatment options for heavy menstrual bleeding. Recently, the FDA approved the use of Natazia (a hormonal contraceptive agent used for contraception) for the treatment of heavy menses in women desiring contraception. This agent, which includes bio-identical estrogen, has been studied in women up to age 50. In addition, the Mirena intrauterine system (approved for contraception for up to 5 years in the US) has also been approved to use as a therapy for heavy menses. If you flood or soak through pads and tampons and loath to ever wear any white clothes, then you need to see a women's health physician pronto! If you are anemic (have low blood count) which can cause unusual cravings (called pica) you need to be evaluated and treated. Chewing on ice cubes can be a sign of low iron as well as craving dirt or kitty litter! 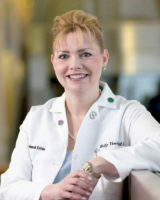 Sometimes thryoid problems or bleeding disorders are the culprit but most often it is a correctable anatomic problem like a fibroid or a polyp that can be treated with minimally invasive techniques; other times it is a hormonal imbalance that can be treated without hysterectomy or any procedure. Sometimes, a hysterectomy is needed, particularly if fibroids are larger than a five month pregnancy or in the case of cancer or pre-cancer. However, you and your doctor should consider all options before resorting to major surgery, particularly in the instances where hormonal imbalance is the cause. Other treatment options for heavy menses might include uterine fibroid embolization of fibroids or endometrial ablation (permanently removing or reducing the endometrium which is the inner lining of the uterus). In general these options are only selected in a woman who does not plan on future childbearing; while hormonal options such as Natazia and the Mirena IUS do not preclude the option of future child bearing. So, this is one instance where you definitely should not go along with the flow as you will get along much better by bucking that flow!